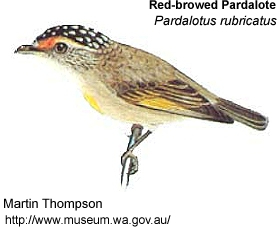 The Red-browed Pardalotes (Pardalotus rubricatus) occur naturally in the northern two-thirds of Australia. It is common in the north-west, where it is usually found in dry woodlands and mulga; it is rare in the eastern part of its range. It measures between 10 - 12 cm in length. It is slighter larger than the the similar Forty-spotted Pardalote. It can be differentiated by the paler plumage.